This week I'm going to do something a little different. Instead of just reviewing the fake meat product, I'm also going to give you the recipe I used it for. Most things I've done so far haven't really been conducive to recipe-sharing, but this one is a doozy. Here we go. For this recipe I used Morningstar Crumbles. It was my first attempt with this brand of crumbles. These are frozen, like the Boca crumbles, but they don't all come in the same dog-food-like shape. The crumbles actually look a lot like meat, which I appreciate. I ended up cooking it a lot longer than the recipe said, because I went out for a walk in the middle of it (I turned off the heat while I was out of the house, but it was all still hot, therefore still cooking), but none of the textures suffered even slightly. The fake meat was nice and chewy, very similar to real meat, and my noodles weren't too squishy. This soup was amazing! I will definitely be making this again, and I strongly suggest you do too. The recipe I used came from this site with a few of my alterations. I'm posting what I actually did below, but if you want to know how it started out, check out that link. I also just found, on Morningstar's website, this product which might also work very well for this recipe, maybe even better, if you're into sausage in your lasagne. Let me know if you try that out. In a saucepan or stockpot (I used my Dutch oven) heat the olive oil over medium heat. Add the onion, and garlic. Cook, until onions are softened. 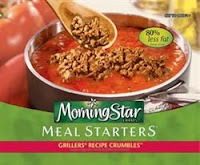 Add Morningstar crumbles and break up in to small bits. Add dried basil, oregano, salt, black pepper, tomatoes, tomato sauce, and chicken broth. Bring to a boil. Reduce heat to medium-low and allow to simmer for 15 minutes. Add spinach and pasta, and continue to cook until pasta is done, according to directions on package. Meanwhile in a small bowl stir the fresh, chopped basil (if using) into the ricotta cheese. When soup is finished, ladle into shallow bowls. Carefully add 1/4 cup (I used 2 tablespoons or so) of the ricotta to the bowl. Sprinkle with freshly grated Parmesan cheese and basil if desired. This week, I'm going to review Boca's Bruschetta patty. This isn't technically replacing a meat product, since I don't think I've ever had a tomato basil parmesan burger, although that sounds delicious. I just saw it in the store and thought it sounded tasty. We'll get back to the proper fake meat products next week. I had some fresh, homemade gnocchi that one of my classmates had made in school, but I didn't have a whole bunch of it, so I figured I'd whip these patties up to go with it. I took the idea from the box to cook them in a skillet in some oil, hoping for a nice crispy crust. Unfortunately, my timing was off (the gnocchi took longer to cook than I was expecting), so the patties ended up a little overcooked. We ate them anyway, of course. But I'm keeping in mind that they could be better. When overcooked, the patty developed a leathery exterior, and didn't have much in the way of flavor. They had a smell almost like they wanted to be more tomato-y. Like maybe someone had carried a basket of sun-dried tomatoes through the patty factory, and they picked up some of the aroma. The ingredients do list "oven roasted tomatoes", and it's pretty high up the list. I think I may have bitten into a chunk of tomato at one point, but aside from seeing it, there was no obvious tomato experience. I then tried a bite of the gnocchi with a bite of the patty. This was better, mostly because it provided the patty with a nice selection of flavors. Honestly, I do want to try these again at some point. I feel like there's potential here, I just cooked it too long. I will do better next time! I swear! • Place frozen links in cold skillet. • Add 1/4" of water. • Cook over MEDIUM heat, allowing water to evaporate. • Cook 2-3 additional minutes, turning frequently to allow product to brown. I did what it asked of me. First, the water took FOREVER to all evaporate. I made all my pancakes while this was happening. Then, once the water was gone, the sausages started to stick really bad to my amazing non-stick skillet. Nothing I have ever made has stuck to this skillet, so I'm not sure what these things are made out of that caused them to stick. Due to the sticking, I didn't get a nice browned exterior. Well, I'm sure I did, but it tore off the sausage when I took it out of the skillet. In any case, the rest of the food was done, and the sausages were hot, so we went ahead and ate them. The sausages on their own definitely did not taste like a real-meat sausage, although it was obvious that it was trying. Instead of the typical soy flavor, it tasted very strongly of sausage-spice. Mostly pepper, I want to say. The texture, though, was not great. Very mushy. At this point, I remembered my typical sausage-eating strategy of wrapping a bite of sausage in a bite of pancake and eating them together. This disguised both the flavor and texture problems. At this point, it was just like eating a real-meat sausage, and I enjoyed it quite a bit. I highly recommend this technique. This week, I'm doing something a little different. I'm pitting a fake meat product directly against real meat to see what kinds of differences I can observe. So here we go. I made two boxes of Hamburger Helper (Cheeseburger Macaroni), one with ground beef, the other with Boca crumbles. I did everything I could to cook them the same way, including browning the ground beef then removing it from the pan to cook the noodles and sauce separately, so I wouldn't over-beef the sauce and bias the results. The only thing I forgot is that the Boca crumbles are frozen, as opposed to the Smart Ground crumbles I had used before, so I overcooked the noodles a bit, waiting for the crumbles to thaw and warm. Oops. I also had a few help me eat all this food. Two were the pescetarians who inspired all this, one is my best friend who also sometimes eats fake meat, one was my totally meat-eating roommate, and last, but not least, my wife. We each took some of both types. I'll be honest - they looked fairly similar, aside from the fake meat crumbles being shaped a bit like cat food. A little off-putting to make that comparison, but we ate it anyway. Once we smelled it, or tasted it, however, the differences were totally obvious. There's no sneaking this fake-meat meal past a carnivore. So we dug in, fully aware of which was which. No blind taste test here, I'm afraid. The consensus seemed to be that both were good but the real meat was definitely better. One of the pescetarians mentioned that if she hadn't had them side-by-side she maybe wouldn't have noticed that the fake meat one was as different from real meat. So that's a good insight into learning to eat fake meat - don't ever eat real meat, and you'll start to like the fake meat version more. Texture - The Boca crumbles were a little chewier than real meat, or maybe chewier in a slightly different way. More rubbery, less, for lack of a better word, meaty. Flavor - The flavor of the Boca Helper was definitely very soy-ish, which makes sense. Not bad, overall.